“Mandala” is a masterwork of art and stagecraft. Dancers use their bodies as instruments, and they need constant training and upkeep, research and inquiry. Over the last two years, dancer/choreographer Kun-Yang Lin put his company of nine through a varied, rigorous training program. Thursday night at the Painted Bride, it premiered the fruit of that program, called Mandala – the intricate, ephemeral, circular sand paintings of Buddhist and Hindu tradition. As observer and chronicler of the Mandala Project over many months, I had watched KYL/Dancers in rehearsals as well as at workshops with a martial-arts expert, a puppet master, the Dalai Lama’s former ritual dance master, and a teacher from Taiwan’s acclaimed Cloud Gate Dance Theatre. Yet I was still startled to see how Lin wove those investigations into his choreography in final form. Heidi Barr’s exquisite crimson costumes, Stephen Petrelli’s striking lighting, and Jonathan Goldman’s spiritually driven music, along with a gorgeous visual design for the first of the five sections, elevated Mandala to a masterwork of art, spirituality, and stagecraft. Puppet master HuaHua Zhang had put the dancers through practice in working with objects, investigating how to imbue them with humanity, humor, pathos. Using large swaths of crinkled paper, she worked with Lin, Petrelli, and the dancers to create a wondrous, many-legged, mammoth-like creature by having the dancers manipulate the material around and above themselves. At the end of the beast’s laborious diagonal entrance, the dancers broke out individually to whirl within the paper, which suddenly seemed lustrous and fluid as silk. Monk, composer, dancer, and director, completed a residency at Bryn Mawr College Sunday with a performance featuring her “Education of the Girlchild” from 1972. 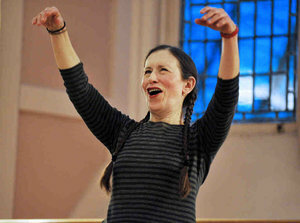 At Bryn Mawr’s McPherson Auditorium Sunday afternoon, the first dancelike movements Meredith Monk made in her 1972 solo from Education of the Girlchild were small, rhythmic hand movements. They opened up to a still-minimal and unembellished upswept arm, a small bend, and a turn of the knee – not so much dance, but the expression of dance.The performance was the culmination of a weeklong residency in which the Peruvian-born Sarah Lawrence grad and MacArthur Fellow, who was just named one of NPR’s “50 Great Voices,” led workshops that explored her singular brand of vocalese and movement. Monk, 68, begins Girlchild sitting motionless in whiteface, wearing a gray wig and baggy muslin pants laced with leather strips. Her puppetlike gestures recall younger days, and soon she removes the wig, reverentially kneeling to the age she would become as she loosens her hair and personifies a younger version of herself. With its superb theatricality and stagecraft, the piece gained in poignancy as I realized she is now reaching the actual age she envisioned 40 years ago.